Just minutes before the end of another deadline day the Harriers have bought our former striker Chris Beardsley back to Aggborough. In a surprise move after being seemingly happy at Kettering he has now re-joined the club he left following our relegation to the Conference in 2005 after saying he wanted to play for a Football League side. He returned to another former club, Mansfield, but then signed for Conference bound Rushden eighteen months later. He has since spent his time out of the Football League at York City and then Kettering while they were a Blue Square North side. After starting the season as a regular at Kettering he has now found himself increasingly on the bench and more so since the arrival of Iyseden Christie on loan from Stevenage. 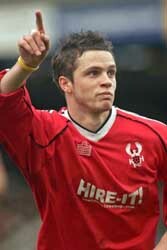 After giving permission to join the Harriers Kettering then turned around and resigned Mark Rawle on loan from Redditch Utd. The Kettering fans are far from happy with this move and see it as a retrograde step by signing a past it, injury prone striker and letting go of a fast pacy striker that can score goals. Good bit of business I'd say except for the worry that the injured Justin Richards may be out for longer than was originally thought. It looks like his bruised eye may well be a dislocated eye socket meaning he could be out for a month or longer. Let's just hope that's not the case and Justin is back soon if only for FA Cup games because Beardsley can't play in those.